If you are learning to write in English, you should have these essential books on your bookshelf and refer to them when you are writing: The MLA Handbook, Elements of Style, and Grammar Girl. 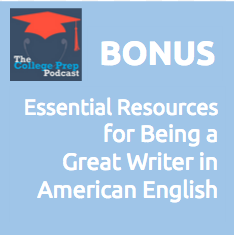 Tune in to hear why they are so important and how to use them to make your writing clear, scholarly, and impressive to American college professors. « 040: How Important are Grades Really?